I had a great discussion on another site years ago about the difference between rocket and tube artillery and while I am certainly no engineer and have no military experience myself, I am unable to see how you may be able to replace both a 105mm light system and a 155mm heavier system with the same weapon. Surely they are both used in different ways against different targets? What do the soldiers who are supported by these weapons and the people who serve the artillery systems themselves think about the idea? It's a US procurement thing. The HMMWV was slated to replace a range of vehicles, from the mechanical mule to the Gamma Goat. The HWWMV handled the higher end of the scale but sort falls short of the small/light class like the Mule, M151 and M422. Edited by rmgill, 03 March 2018 - 1340 PM. Thank you for the very detailed response. As you put it, creating a system that has the best attributes of both the 105mm (being light-weight) and the 155mm range/lethality seems to be a good idea. It would also help in the logistics sense as well, having that "common round". I suppose that's one of the reasons why I was surprised that Soltam's "Rascal" 155mm light-weight artillery system hasn't been snapped up yet. I can't figure out the quote function, but I'm replying to your post #17. First, my bona fides. I've been a Field Artillery officer in the U.S. Army for 21 years this summer. I've served 9 years of that in light and airborne infantry units, including duties as infantry company, battalion, and brigade fire support officer/coordinator, battery fire direction officer (computing firing data for the howitzers), assistant battalion operations officer/S3, and firing battery commander. I've served in Iraq and Afghanistan as battalion and brigade fire support officer/coordinator, assistant battalion operations officer, and battery commander. I've also served 2 years in MLRS, and 3 years at the Field Artillery School/Fires Center at Fort Sill, among other duties outside the Field Artillery specifically. First, yes, the requirements are developed by users at the Fires Center of Excellence, in the Capability Development and Integration Directorate. Officers and NCOs rotate from operational units to the CDID, serving in the TRADOC Capability Manager, representing the user to the Program Executive Office's program managers, who work with industry to procure solutions to the requirements developed at the CDID. That's a snapshot summary of the JCIDS process, which is a spaghetti chart from hell. Currently, both 105mm and 155m towed howitzers are used essentially interchangeably in the cannon battalion of IBCTs. Until recently (~2013), the battalions were pure 105mm, based on decisions made in the mid-80s about weight of ammunition and equipment versus strategic lift capability. However, since precision technology became available in 155mm much faster than 105mm, IBCTs were requesting (and deploying with) 155mm units taken from general support capabilities, in order to increase the range covered by a single firing point and to provide precision capability. Many 105mm units operated 155mm pieces in theater, beginning as early as 2005 in Afghanistan. As our technology has developed since the creation of the 105mm and 155mm shells (which were based on lessons learned in WW1, and the basic division was implemented in WW2), I think that we can create a system that provides the range and lethality of 155mm (its big advantage) while maintaining the lightness of the 105mm (its biggest advantage). The M777 howitzer cut the weight of the M198 howitzer by nearly half, IIRC, although it didn't do anything about ammunition weight. In my mind, the critical requirement missing in current US field artillery is tactical mobility. We need to go to SP, even if it is wheeled. The Fires Center at Fort Sill has been working with ideas for at least the last 5 years, but budgets and priorities determine what actually gets done. This is a good thing that has been a long time coming. One shouldn't accept such lessons learned 1:1, though. 18 152-155 mm SPGs with MRSI of 4 shells each in a radius of 25 km are a pretty good substitute for a BM-21 battery salvo if the radio data links work as advertised and fires can be made to converge on time and target. Neither Ukrainians nor Russians had such a capability there. Also, things like BM-21 cost so little and add so much that it is a total waste not to have them, you can easily have ten for a cost of the single PzH2000. Rockets are more expensive than shells, but not that much so with a modern composite technologies. Additionally, if you are in the PGM craze, they are more easily adopted to those. BTW, Russian upgraded 2S19 does have option for MRSI. Rockets are terribly inefficient for supply being heavier and more voluminous than shell+propellant modules. BM-21 is very inefficient due to the dispersion - with modern SPGs you can actually shoot controlled patterns with much less effect overlap. BM-21 is also short-ranged, and longer-ranged MRLs and their munition are usually quite expensive compared to BM-21. BM-21 munition resupply is slow. Personnel costs of more BM-21 outweigh the higher material costs of a SPG. SPG are more versatile (point AND area fires with dumb rounds, unrestricted switching between munition types, shorter minimum range, better control of descent angle which is important with HE, can bend trajectory well to reach rear slopes, thicker shell walls compared to rocket HE allow for better cratering etc.). One may prefer a mix of SPGs and MRLs over an all-SPG force and I get that (though I don't think so for ICM or plain HE rounds), but MRLs are no 'must have' and there's not mcuh of a case for MRLs below divisional level being a very good idea (especially not in mobile warfare, see the logistical and minimum range issues!). MRL effects can be emulated with SPGs. IBCT/SBCT need wheeled SPGs with 155 mm L/52, period.- buy Caesar 2 and be gone. Airborne cannot have a peer OPFOR-capable artillery, period. No such arty is air-droppable. Big budgets don't change this. You either get too little mobility or too little range. The U.S.Army/82nd needs to face the fact that it has no combined arms airborne and cannot have it either. So let them make do with 120 mm mortars when they are beating up 3rd world warbands and let them use the same wheeled SPG as the IBCTs/SBCTs when they need to go against peer OPFOR. The entire M777 was a stupid dinosaur idea thinking from the beginning. Save for the accuracy and dispersion improvements that come with being a new design (including MV radar) the M777 is less capable than 1970's 155 mm L/39 towed howitzers (just look at the puny traverse of the M777!). And those were stupid ideas already, conceptually outclassed by D-30 in details and easy prey for counter-battery radar-equipped WP forces. 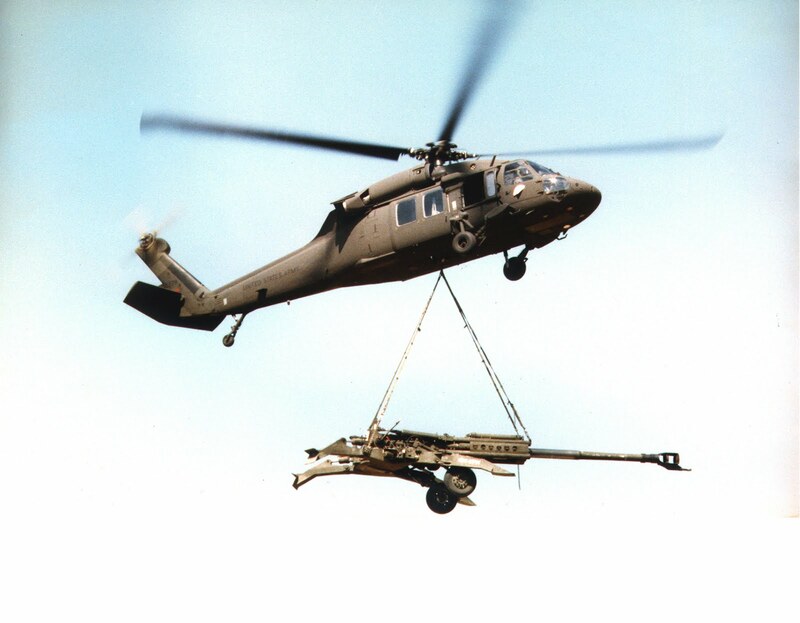 Can't the M777 be lifted by a UH-60? That's comparable to the older 105mm howitzers. There is certainly utility there for airborne/airmobile forces who won't always be up against near-peer opponents anyway. Plenty of uses for towed artillery in all sorts of fighting in 3rd world hellholes too. More SP artillery for the Stryker and infantry units would make sense though, but you don't need it to be 100%. The ability of UH-60 to lift M777 appears to be rather theoretical. The range, temperature and altitude restrictions combined with the availability of CH-47s make it a quite irrelevant possibility..
Anecdote: A year or two ago I searched for a single photo showing a H-60 carrying a M777 as a sling load, and all I found was an unusable grainy one. How exactly does one load that up? Set the arty next to the helicopter, attach the cables, and then let the helicopter swing over the piece as it takes up slack? @FAL; something 404ed your link. Edited by lastdingo, 03 March 2018 - 1903 PM. If you wanted to meld 105 and 155, then the 122mm gun works well. It's actually better to have both, as you can bring in a 105mm by helo and it's ammo by medium lift helicopters. They also ease your training budget. Sighting and laying system should be common, which was one thing that most US artillery pieces had. Over at thinkdefence.co.uk they had a similar discussion in 2004 about an ideal compromise between 105 vs 155mm howitzers and concluded that the Russians were on to something with their D30. I suspect Chinese firms need not apply to US Army RFIs but their modernised incarnations of this old Russian warhorse with modern fire control, extended range, self-propelled on various light trucks, wheeled and tracked armoured vehicles, etc. could serve as some inspiration. Of course NIH and caliber not in current supply chain applies. If you want something heavy that can be take in by air then there may be a case for an extended range 120 mm or even ~160mm mortar. A 105 mm pack howitzer is going to be heavier and more bulky, take more time to emplace, have better range but still not enough for CB fires, and inferior HE rounds. Edited by KV7, 04 March 2018 - 0255 AM. KV7, 120 mm fin-stabilised HE and 105 mm spin-stabilised are very close to each other. The former often has a better angle of descent, but the weights of the ammunition are very close and the explosive filler is typically a little over 2 kg each. "Pack" howitzers are not being produced any more afaik. Transportation by mules and sleds is out of fashion - it's all about helicopters now and the post-UH-1 helos can deal with 1.5 tons in one haul. A M1069 HMMWV can tow a 105 mm easily. The last successful "Pack" howitzer was the 105 mm OTO-Melara M56 type AFAIK, and it fell apart when used much in Vietnam. Edited by lastdingo, 05 March 2018 - 0939 AM. The Russkis recycled their 2S1s into 2S34s. ETA:- OTO 105mm Pack howitzers fall apart when towed. SOP for them in the Malaysian Army is now just to portee them between firing positions. Edited by Simon Tan, 04 March 2018 - 1127 AM. 120mm mortar has ECR that is closer to 155mm than 105mm, save for the 105mm PFF and others of enhanced performance. Air transport of 155 arty is stupid IMO, since you're not going to be hauling the prime mover, so it's basically throwing it away if the enemy has any meaningful counterbattery. A 160mm mortar lofting a rocket boosted shell with a GPS guided fuze would be cool and fairly light, probably on the order of "pack howitzer" scale. Much greater effect on target. When using "smart" shells, you want to maximize the explosive delivered per expensive guidance system expended, thus favoring larger calibers. If you're just using dumb shells to suppress for time to facilitate maneuver, then small crap works fine. 105mm LEO or V2C2 would be smart there, and not too bad on the ECR front when using PFF ammo. Mortar ammo is generally better transport, as lower volume/shell weight ratio. I suggested a 127mm mid range arty piece some years back, using 155mm modular charges and the USN 127mm 70lb shell. Capitalize on developed asserts. Sorry for the bad link. I can't quote, and I can't paste, so I have to type the links in. That's probably what did it. That's how you hook up. Hooking is fun. The large, q-tip looking thing being held by the soldier that is furthest left and highest on the howitzer is called a "cargo hook reach pendant" and comes in both 10k and 25k lb strengths. If you don't have one, you can discharge the static from the helicopter using a static discharge probe before you hook up with a metal clevis to the metal cargo hook. If you don't, it can get interesting. When I was a support platoon leader, my platoon ran the heavy pick up zone during brigade air assaults, since the FA battalion has most of the heavy loads, but the support platoon doesn't normally go on the air assault package. Exciting times! !